Monument Valley isn't about man made monuments. It's about natural formations which are known to any watcher of Western movies. These are the red bluffs and tall plateaus found in southern Utah and northern Arizona. This location is in the Navajo Nation territory. It is considered sacred by native Americans. In the Navajo language they know of this region as Tsé Bii' Ndzisgaii, which means quite appropriately Valley of the Rocks. This area is GORGEOUS. There are so many types of landscape here that are simply beautiful. Pretty much every photo in this slideshow is of a type of landscape that I love, and the range of landscapes is extremely wide. There are areas with layered rocks. Areas that look literally like "sand art" creations with rippled colors. Movie makers have loved this area as being more beautiful than any set they could possibly build. Back in 1939, John Wayne was filmed here for "Stagecoach". The audiences adored the region, and many westerns since then have been filmed here. If you saw the Eiger Sanction with Clint Eastwood, the tall pillar he climbs at the beginning is in Monument Valley. Mission: Impossible II also features Monument Valley climbing. It is NOT legal to climb here in modern times. Easy Rider rode through here. Forrest Gump ran through here. Even 2001: A Space Odyssey featured this area as a "strange planet" (Mars?). Even the Airwolf TV series with Jan-Michael Vincent was set here. Native Americans respected this area greatly, and many reservations are still found around this region. I am so happy that this area has remained pretty pristine and untouched! 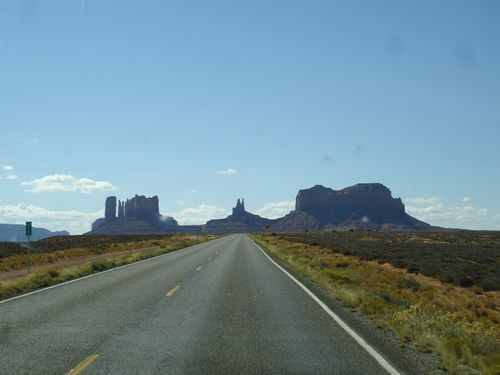 The pictures on the topic of Monument Valley Utah for this slideshow were all taken by Lisa Shea.